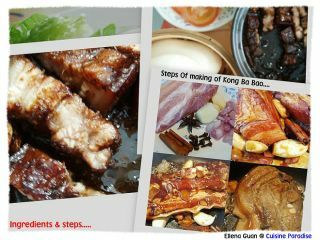 Kou Rou Bao(扣肉包) or Kong Bao Bao... that's what we usually called this Chinese snacks. 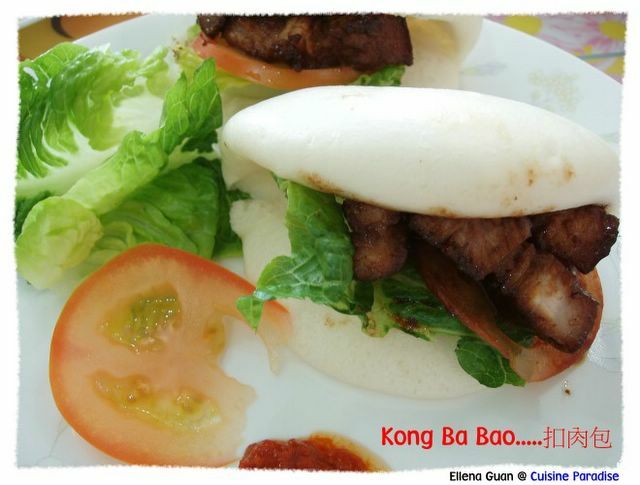 I love this especially the stew pork belly which is so soft, tender and juicy when you bite it off from the bun. I had also tried a similar stew pork belly dish in the previous post on Dong Po Rou. But this taste and methods are abit different from this. This stew Kong Ba is towards the dried type of meat where you don't really add water to stew but rather pan-fry it on very very low heat and simmer on it's very own natural juice from the meat. I got to learn this method from one of the mummy from my son's playgroup. 1. Wash, clean and trim the pork belly then marinate it with the seasoning, cinnamon stick, star anise, cloves, garlic and shallot for at least 2 hours or overnight. 2. Preheat a small claypot with some 1 tablespoon of oil and saute 3 cloves of garlic and rock sugar to fragrant then add in pork belly and the marinade juice and saute on medium heat for 1 minute then turn it over. 3. Add in 1 - 2 tablespoons of water and let it simmer on very low heat for 30 - 45 minutes, check occasionally to see with if the sauce dried out before the meat is tender, add in extra tablespoons of water and continue to simmer. 4. When done, dish up and cut into serving size and serve together with steam plain bun and lettuce.